“Another year, another breakthrough in Chipotle’s blinding burrito-making speed,” writes Quartz (April 21, 2014). Over the first 3 months of 2014, the US Mexican-food chain saw an average increase of 7 transactions per hour at both peak lunch and dinner hours—12 to 1pm and 6 to 7pm. On Fridays, one of its busiest days of the week, Chipotle fielded 11 more customers per hour at lunchtime on average across its stores, a 10% increase. “One important element of delivering great customer service is you’ve heard us say over and over is faster throughput,” says the CEO. “We’re excited that our teams are ready to break new throughput records.” Another way to think about throughput is to think about it as burrito-velocity—that is, the speed it can funnel a customer and the burrito being made for them from the beginning of its line to its end. The chain puts every part of its assembly line under a microscope to make sure it functions as efficiently as possible. As far as the company is concerned, faster service is the same thing as better service. 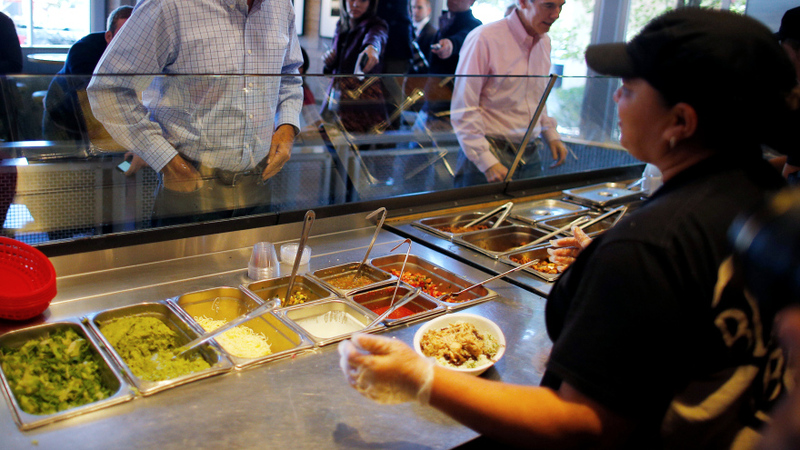 For that reason, the chain is finicky about things Chipotle-lovers likely hardly even notice. Credit cards, for instance, are better than cash, because they’re faster. And that person who wanders around cleaning off counters and re-filling empty meat, vegetable, rice, and bean containers is crucial. In fact, she even has a title: linebacker. Linebackers, who patrol countertops, replace serving-ware, and refill bins of food, are one of Chipotle’s four, Maoist-sounding pillars of effective lightning-speed service. The others, which together make up what the chain refers to as its “four pillars of great throughput,” include the extra person between the one who rolls your burrito and the one who rings up your order, a commitment to having every ingredient and utensil in its place, and finally, making sure its best servers are always working at peak hours. Some of Chipotle’s fastest restaurants currently run more than 350 transactions per hour at lunchtime, which equates to nearly 6 transactions per minute!